When it comes to the contract portion or contract piece for consignment inventory or vendor managed inventory you will want your form to include details on how the inventory will be managed both by the Consignee and the Vendor. Items like storage, replenishment, returns are just a few areas you need to cover. Before we get too deep into details lets clarify or define the parties typically involved in a consignment transaction. Consignee is the business, person, agent, organization which merchandise is consigned or Consignee is the receiver of the goods not yet owned. Consignor is the Vendor or company which owns the inventory until it is used or sold by the consignee. Now that we have that straight, lets move into some areas you should address in your vendor consignment agreement. Inventory Management: Consignee shall store and manage products produced or supplied by Vendor (the “Products”). All products shall be delivered to Consignee on a consignment basis. Consignee and Vendor shall mutually agree on which Products will be consigned to Consignee under this Agreement before the Products are delivered to Consignee’s Facilities. For purposes of this Agreement, all Products which have been delivered to and received at the Facilities shall be referred to as “Managed Inventory”. Space Allocation. Consignee shall store the Managed Inventory at the ________________ (location). Consignee reserves the right to store the Managed Inventory at other Consignee facilities or at a third party warehouse location, provided that it advises Vendor of where the Managed Inventory is located and that it bears all costs associated with relocating the Managed Inventory to the other Consignee facilities. There are many types of arrangements aka vendor contracts you can enter into with your suppliers. If you are looking at employing a partnership philosophy, one to consider is Consignment Buying. What is consignment buying or vendor owned inventory? A definition of vendor owned inventory or vendor managed inventory (VMI) is when a supplier (the company you purchase from) maintains an inventory bank in the buyer’s facility which is under the buyer’s control. The buyer assumes responsibility for perpetual activity or accounting for withdrawals or usage of stock from the consignment inventory, payment for quantities used and notification to the supplier of the need to replenish inventory. Verification of quantities remaining in inventory is jointly done at periodic intervals. This strategy has advantages for both the supplier and buyer. The buyer benefits by having reduced inventory investment which can free up funds for capital or other investments and the supplier is assured supply or captive volume. This type of partnership arrangement is often used in the distribution industry. Some of the other benefits the buyer gains is it removes or eliminates the risk of obsolescence. Obsolescence is often overlooked and it is when the inventory no longer meets your requirements and therefore is returned or sold as surplus. Under a consignment arrangement, the Vendor still owns it therefore they assume the risk. There is a cost associated with tying your vendor into a consignment arrangement. You can be assured that you will be paying more for your inventory vs a spot buy for the same goods but as a business owner you have to weigh the pros and cons and make your decision based on your existing financial and staffing requirements. For some, the opportunity of using your capital elsewhere, eliminating dealing with obsolete stock, managing the inventory surpasses the extra cost incurred or paid for vendor inventory. What should a consignment contract look like? What should be included? Stay tuned or subscribe to our feed as the next post will answer these questions and provide further insight on sample consignment or vendor managed inventory agreements. 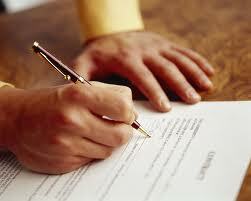 With over 25 plus years in the purchasing profession we have seen Vendor Contracts take on many forms. In the early days some were pretty scary and we would be challenged to even call them a contract. They were more like a glorified hand written fax! Our profession has evolved and writing a vendor contract can mean a one pager or it can be a 300 plus page vendor agreement. Here is to hoping you get more 1 page ones. 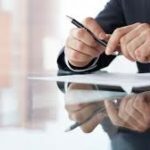 With the litigious environment companies are faced with today, it doesn’t matter whom you’re doing business with, it is prudent to draw up a vendor contract to clarify the duties or scope of work which will be carried out by each party involved. Spend the extra effort and make it clear. How do you make it clear? Have a second party proof read it for you to make sure it flows and makes sense to a first time reader. To ensure there are no misunderstandings, include an example showing any cost breakdowns and final results. This works great if you are purchasing a commodity where the price is based on several pricing mechanism. An example, market cost or base price of item + bridging or freight + packaging + taxes = $Price Paid by Company for next three months. In this instance, there can be no misunderstandings by any party which will examine the agreement at any future date. The main elements of a vendor contract are the cost, services and products to be provided, what will happen if something doesn’t go as planned (contingencies), and the applicable dates for final delivery. The objective is to be thorough, eliminate unknowns, liabilities and ensure every scenario is covered in your contract. You do not want to get burned nor do you want a vendor to suffer punitively in the process. A company which is fair to its vendors gets a solid reputation and everyone wants to deal with owners which treat suppliers fairly. If you properly solicit quotations for your requirements this process will ensure you never pay more than what the present market allows. Not many websites offer free contract templates, RFQPro.com does. If you subscribe, included in our welcome pack is RFQ4 – Service Contract template for consulting services. 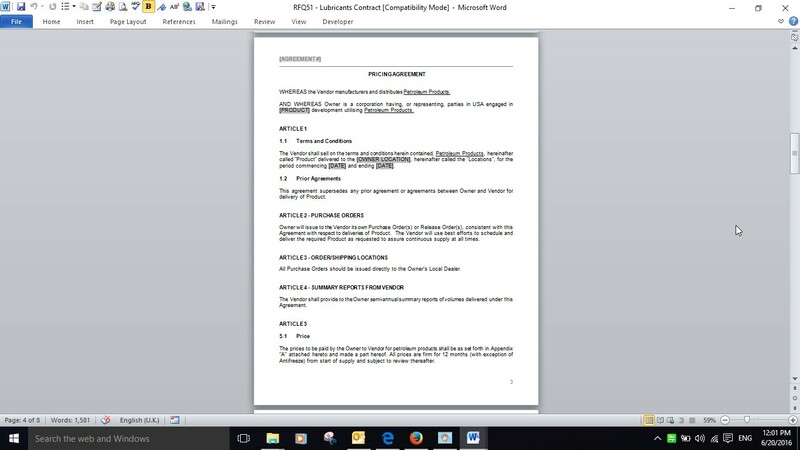 This contract template can be used for labor services arrangements and more. 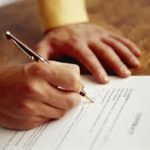 If you are in need of other types of contracts like supply contracts, RFQPro.com can help. RFQ51 – Lubricants Contract is a pricing / supply agreement template which can be tweaked and used for most of your consumables contracts or for commodity based needs. This digital download delivers in both Microsoft Word and PDF format. RFQ51 – RFQ54 contract templates are now available in the Premium Template and Contract Packs and must be purchased from the RFQ Contract Pack or Premium Pack link in the left margin or on the Special Offers page. Our latest addition to the template library would be used in the event you need to hire a temporary supervisor, foreman, lead hand, contract employee or any fee for service type personnel. This is a contract template for service. Ensure you replace the RFQPro.com text with your own company name, address details.